Home / Engagement rings: Custom Design / Oval Diamond / “Maricela” Bezel set Oval cut diamond cluster ring. “Maricela” Bezel set Oval cut diamond cluster ring. 18 ct white gold, halo cluster design ring , custom made for a client. The central oval diamond of 0.50 ct surrounded with smaller round brilliant cut diamonds. One of the advantages in having an oval cut diamond is in the relative size to other diamonds types, the cut being shallower at the ends, give the impression that the oval cut in any given weight is larger. 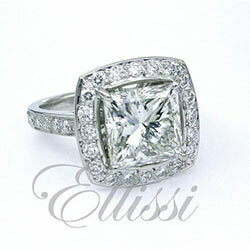 A great option for many rings , however as with this one, its needs very careful selection to get the best cut. In the mid range grades SI1 – VS1 with high colour this ring fit well in the $4,000 – $5,500 price range with a GIA certified central diamond. “Cherish” Antique style oval band. “Jane” Oval and round brilliant cut trilogy ring.